Casco Viejo or the Old Quarter is where Bilboa was born. It has a historic atmosphere with narrow streets and ancient buildings but at the same time it is active and alive. People still live in this district and they mingle with visitors in the shops, cafes and street life. The Old Quarter is sometimes called the seven streets (Siete Calles). Originally, there were three streets inside the city walls. However, as the city grew, it became necessary to take down the walls and four additional streets were added. Located by the River Nervion (Ria de Bilboa), the Old Quarter was devastated by floods in 1983. However, much reconstruction and restoration work has been done. As a result, today, the Old Quarter is a pedestrianized area including shops, restaurants and cafes as well as museums and historical attractions. 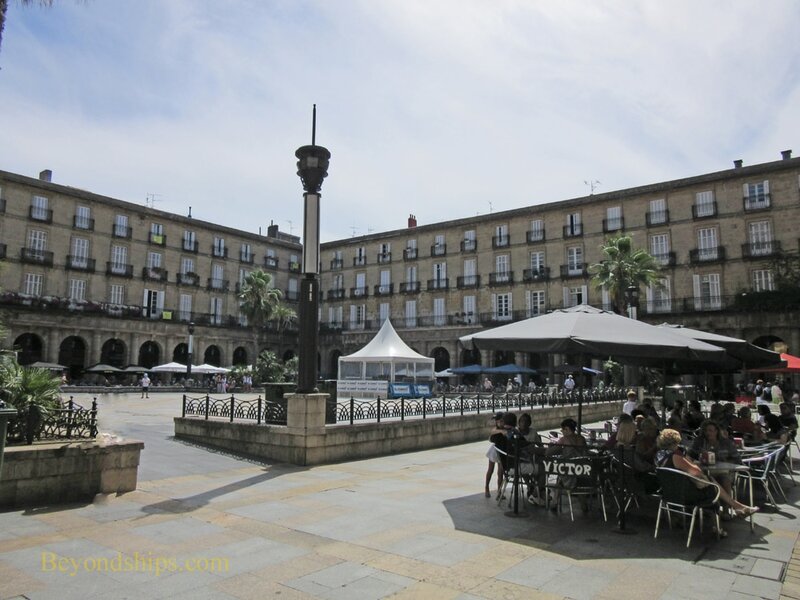 The centerpiece of the Old Quarter is the Plaza Neuva, also called Plaza Berria. You enter the square through archways that cut through Neo-classical buildings constructed in 1821. The open space of the square is surrounded by arcades. Within the arcades are taverns, cafes and a few shops. Plaza Neuva hosts a weekly market as well as folk festivals and concerts. This can be a very lively place. Patrons crowd the tables under the arcades and the umbrella tables that spill onto the periphery of the square. Plaza Miguel de Unamuno is named after Bilboa's most famous writer, Miguel Unamuno, who was born nearby. 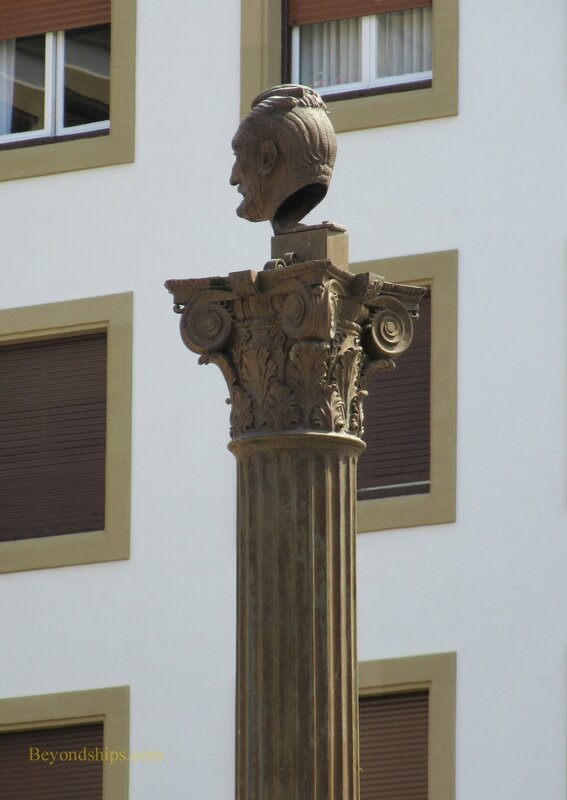 His head glazes down from a column in the square. To the right of the statue is the Basque Museum which is dedicated to chronicling different aspects of the life of the Basque people. The statue faces the Mallona Stairway, which eventually lead to the Basilica of Begoña at the top of the hill. 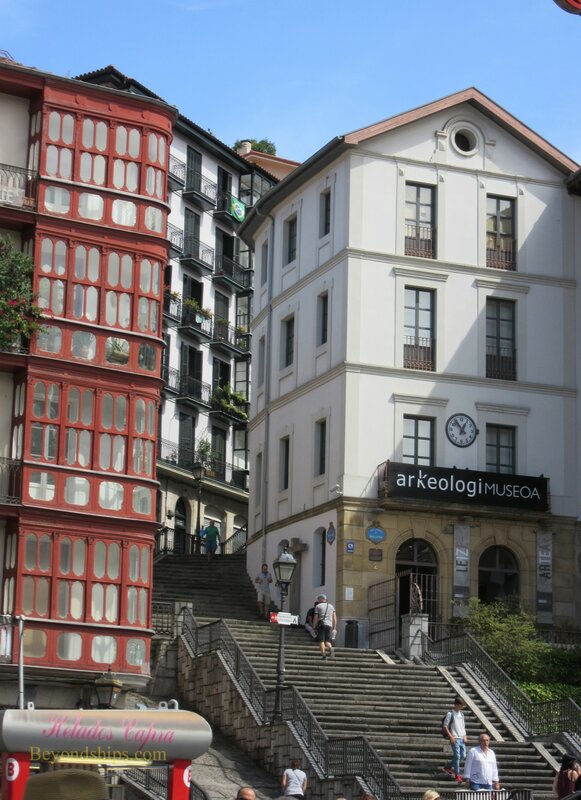 Just up the stairs is the Archaeological Museum, which focuses on the story of the Biscay (Bizkaia) area. The Church of Santos Juanes was built by the Jesuits in 1622. 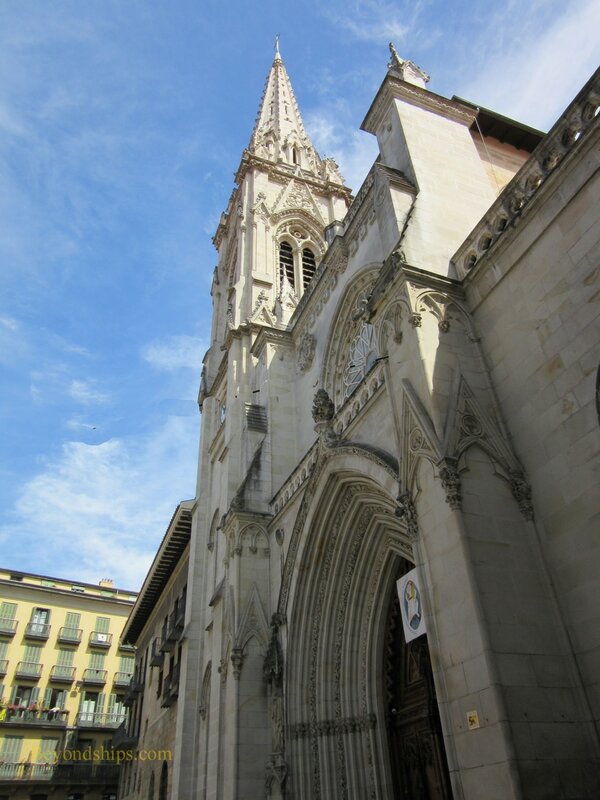 However, after the Jesuits were excluded from Spain in the 18th century, the church became a local public church. It was designed in the Baroque style and has an elaborate interior. Like Plaza Neuve, Plaza Unamuno is often alive with activity on a summer's day. Nearby, the Church of San Anton stands on the bank of the river. It was built in the Gothic style in the 15th century. However, numerous floods have required many restorations over the years. Nonetheless, this church is so identified with Bilboa that it appears on the city's coat of arms. 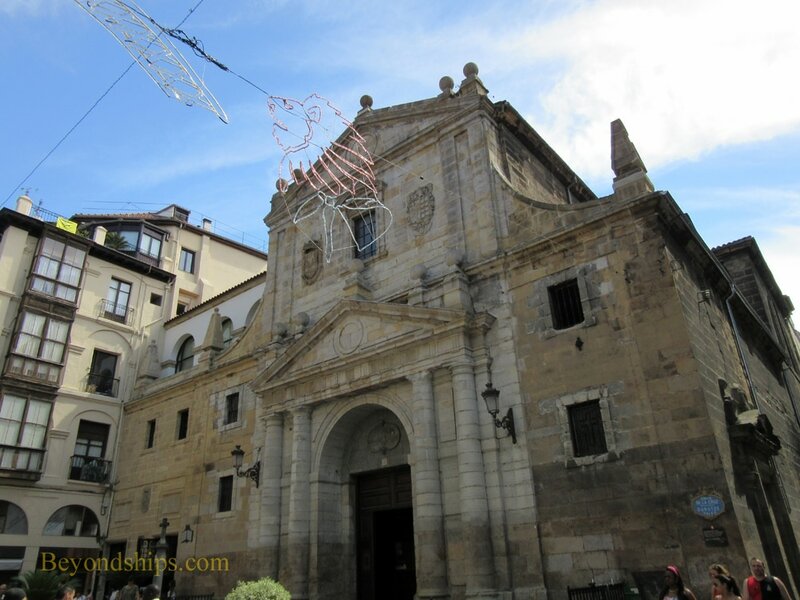 Next to the San Anton church is the Mercado de la Ribera. 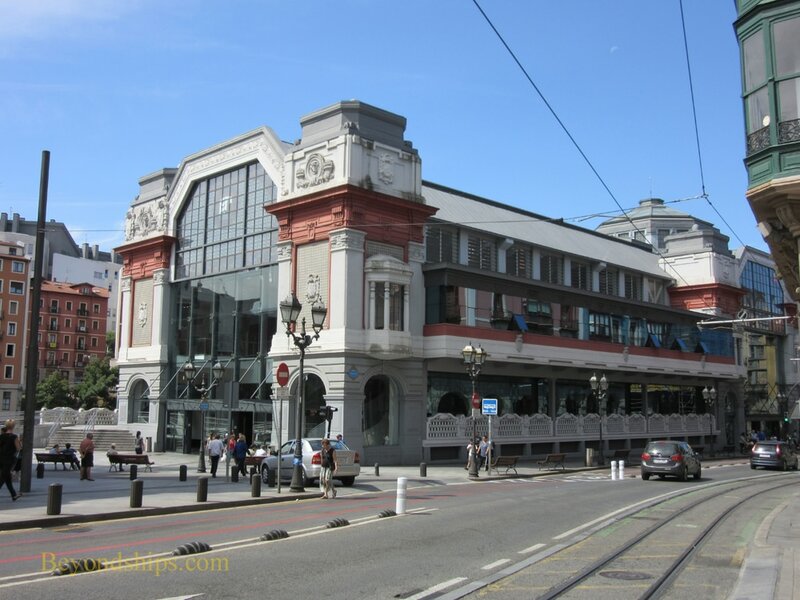 Built in 1929 on the site of the Old Square, this is the largest covered market in Europe. Large sections of he walls are made of glass and sunlight spreads through the building via translucent floors. This is very much an active market where locals buy produce, fist, meat and other types of food. In 1990, the Ribera market was dubbed the most complete food market in Europe by Guinness Book of World Records. Santiago Cathedral (a.k.a. Bilboa Cathedral) is also located in the Old Quarter. 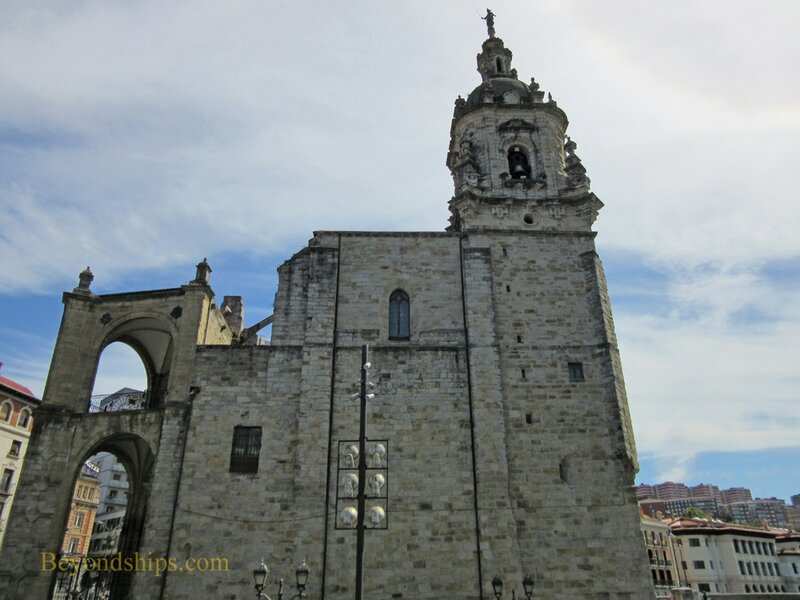 Although it dates to the 15th century, this church was not declared a cathedral until 1950 when the diocese of Bilbao was officially created. The building has a mixture of Gothic and Gothic Revival elements. It is designed in a Latin cross plan with three naves. Highlights of the interior include the sculpture of the Cristo del Buen Amor by Guiot De Beaugrant from 1533 and the 17th century pietà by Aloitiz. An unusual feature is the stone carvings of local merchants in the main vault. The plaza outside the cathedral is another gathering point and in summer street performers entertain the crowds. Above: The narrow streets of the Old Qurter. Below left: The monument to Migeul de Unamuno in the plaza named in his honor. ​Below right: The Mallona Steps leading past the Archaeological Museum. Above: The Church of Santos Juanes. Above: The Church of San Anton. Left: A hidden gem, the BBVA Bank building. 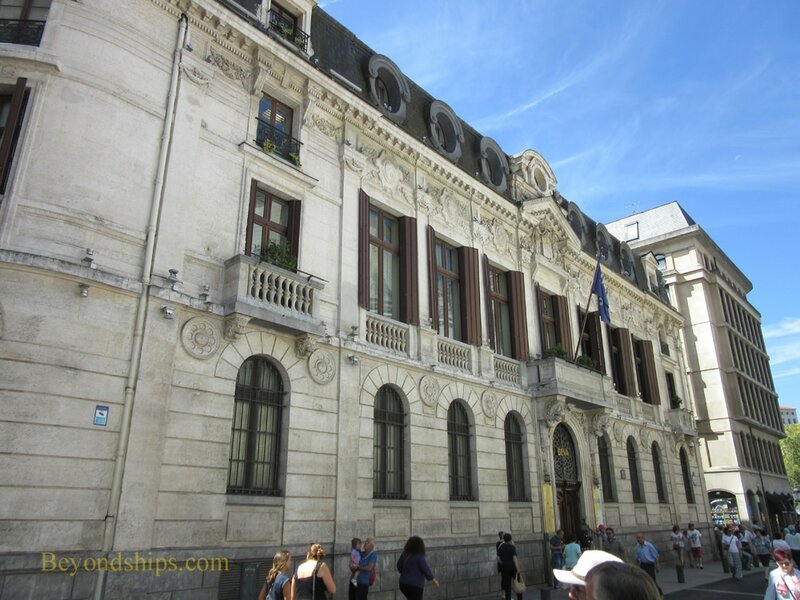 Built in 1888, it was home to the Bank of Bilboa for many years. It has an extensive coin collection that is open to the public.